Swimroll is the ultimate pool cover solution. Having won major design awards, not only is it super stylish, but it’s performance and functionality is simply unparalleled. Remco Swimroll Automatic Pool Covers provide an impenetrable surface, ensuring outstanding pool safety. Leaves, debris and dirt are prevented from entering the pool water, keeping your pool beautifully clean. Finally, Swimroll will eliminate the evaporation of costly heating, chemicals and water by approximately 80%, therefor conserving one of your most precious assets…your budget! 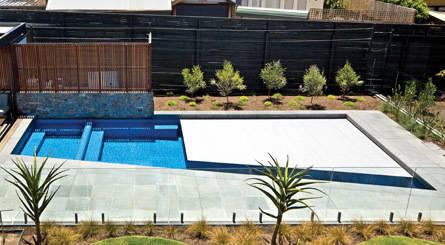 Swimroll, Australia’s favourite fully automatic pool cover system is constructed of high-grade PVC or Polycarbonate extrusions, which interlock tongue in groove. The panels are hollow to ensure high buoyancy flotation and insulation to the pool water. 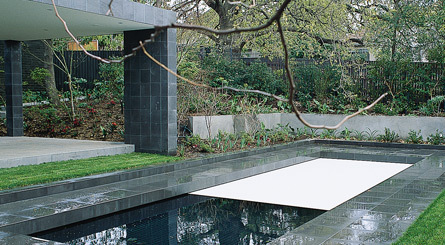 Completely sealed, the panels create a floating floor on the surface of the water. 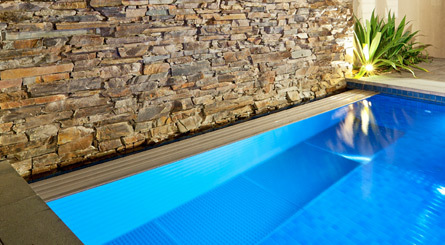 The panels are fitted well into the internal shape of the pool and in some instances, can be adapted to suit varied pool shapes. Pool owners using the cover as an additional safety barrier will have the cover floating above a specially constructed safety ledge 50 mm wide (in new pools). A stainless steel safety handrail can be installed into existing pools to provide the same benefits. Swimroll Automatic Pool Covers can be located below or above ground and roll onto the pool fully motorised. The press of a button, flick of a switch or turn of a key activates the system. 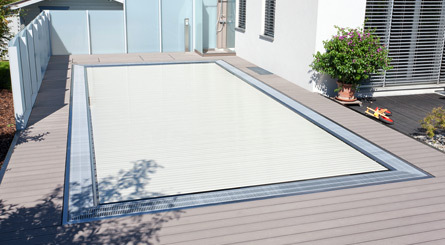 Swimroll Pool Covers may also be installed with a remote control device to provide further convenience to user. The below ground installation provides the perfect aesthetic, totally concealing the device when not in use and maintaining the design integrity of the pool. If the Swimroll pool cover is specified prior to pool construction, requirements for its underground housing will be provided to the pool builder or architect. If the pool already exists, retro-fit integration options are available such as the In-Pool installation (see Swimroll Pool Cover Video Gallery for animation). Please contact us to discuss options for integration in your pool. The Swimroll above ground pool cover installation provides an aesthetically pleasing installation option for existing pool owners. The Swimroll stainless steel roller unit is mounted on the pool edge. Once mounted, several design alternatives are available to the pool owner. The axle may be housed in a classic stainless steel frame, or as some architects have done, designed purpose built housing around the device transforming it into seat, bench or daybed. 1. Pool Safety – Fences can be climbed and gates left open. Swimroll Pool Covers provide an impenetrable surface when operated according to the manufacturer’s instructions. When fully closed, the pool cover can sustain the weight of approximately 80 kilos. The Swimroll poolguard remain buoyant and, with the safety handrail or integrated safety ledge in place, nothing can slip between the side of the pool and the internal wall of the pool *. * In Australia at this time Swimroll Automatic Pool Cover Systems do not replace the need for a security fence around your pool. Parental supervision is always recommended for children in the vicinity of any body of water. Swimroll is not to be relied upon as a safety cover. Leaves, dirt and debris cost time and money to remove and constantly clean. A Swimroll Pool Cover provides a solid, impenetrable surface to the pool that prevent leaves, twigs and falling branches from entering the pool water. The tight fitting Swimroll Pool Cover traps all dirt and debris that lands on the cover when closed, which is then fed into the skimmer boxes when the pool cover retracts – Swimroll Pool Covers clean themselves! Swimming pools require constant heating. Most pools stand idle for at least 23 hours per day. This is where the unprotected pool evaporates your budget unnecessarily. Swimroll pool Covers fit your pool perfectly and insulate against heat and chemical loss, saving up to 80% on heating energy, chemical consumption and thousands of litres of water. 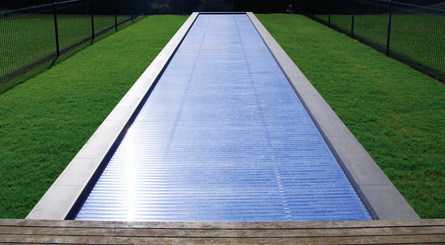 Swimroll’s market leading range of designer colours includes the “Swimroll Solar Black Profile”. This profile captures the heat of the sun within its internal structure, in some instances, replacing the need for solar heating and almost totally eliminating heat loss! The installation of a Swimroll Automatic Pool Cover System translates into huge heating bill reductions, and more environmentally friendly operation of your pool. 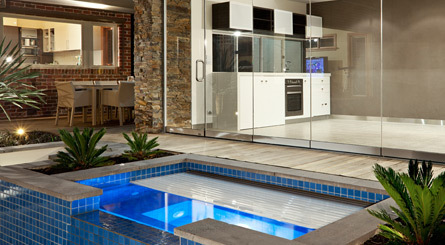 Indoor pools can be even more costly to run. Without a cover, dehumidification systems run 24 hours a day. The installation of a Swimroll Pool Cover will allow for these systems to be turned off when the pool is covered, leading to further considerable energy savings. Without a pool cover, building maintenance costs are high for indoor pool owners. Corrosion of metals, rotting timber and rising damp are all side effects of indoor pool condensation. A Swimroll Pool Cover eliminates evaporation and condensation completely. There are no associated problems once the Swimroll Pool Cover is in place. 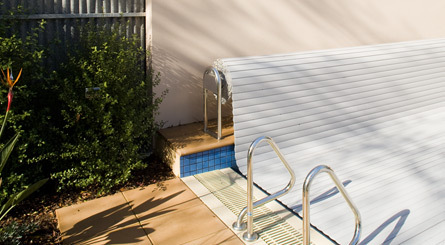 Swimroll Pool Covers have been manufactured in Australia since 1991 exclusively by Remco. 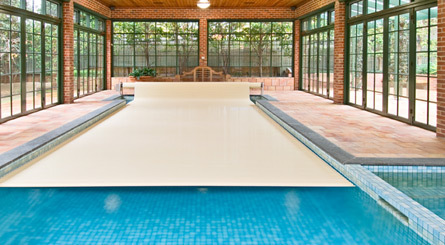 The pool cover and operation mechanism is manufactured in a purpose built factory in Melbourne Australia. Swimroll Pool Covers carry a 5-year Warranty. You can be assured of premium quality and excellent performance. Key switch control: provides owner with a lockable option. Remote control: total ease of use. Home Automation Compatible – for completely integrated operation. Swimroll Pool Covers are available in seven colours; Rock Grey, Pebble-stone, Limestone Yellow, White, Solar Black Polycarbonate, Transparent Polycarbonate and Clear Polycarbonate. Please note the colours displayed below are for illustration purposes only; please request a physical sample before ordering. The ALL NEW Swimroll – Foam Filled pool cover is a completely new and innovative product. All slats are solid, providing both additional rigidity and a perfect finish on curves which can be cut, on site, to fit any shape. The profile structures are made from expanded PVC- foam, coextruded with polyurethane. The exterior is high density PVC, which presents a perfectly smooth surface helping to prevent any algae formation either above or below the water level, and can withstand temperatures from minus 20°C to plus 80°C. This is no ordinary pool cover! It also offers huge insulation advantages over traditional pool covers in terms of insulation properties; Swimroll – Foam Filled pool cover systems have an average thermal conductivity of ?= 0.12 W/(m*K). Swimroll – Foam Filled covers comply with the French safety standard NF P 90308 Version 2006, probably the strictest swimming pool covers standard in the market. They provide excellent resistance to weather and UV which makes them suitable for use all year round and come with Remco’s market leading 5 year warranty. Swimroll foam filled swimming pool covers are available in five colours; Ivory, Cream, Cream Pebble, Pebble and Light Blue Pebble. Here at Remco, we specialise in creating quality pool products that stand the test of time – and nothing demonstrates that like our pool covers! With three incredible options to choose from, our friendly team helps customers find something that works best for them. Combining attractive design, unparalleled functionality and long-lasting durability, you can have peace of mind knowing that when you choose something from our range, it will be the best of the best. Why choose a hidden pool cover? Roll your on or off with ease thanks to our key-controlled designs. Our hidden covers are almost unnoticeable when they not in use, allowing you to maintain the sleek aesthetic of your pool area. Customisation options give you the option of matching your cover to your surrounding design. Our covers are made from the toughest materials, so there is little safety risk for your family like there often is with traditional covers. 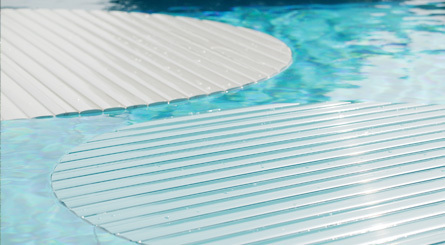 Our designs are durable and made with the highest technology, so your cover will outlast all other pool cover systems. We don’t believe in a one-size-fits-all approach, which is why we offer our customers three incredible pool covers to choose from. Each one is designed to meet our high standard for quality, so regardless of what you choose you can be sure that you’re getting value for your money. Swimroll Cover: Made from durable polycarbonate, PVC or foam-filled options, this automatic pool cover provides unbeatable safety for your family and pets. PoolGuard Cover: Save money on energy and heating costs with this strong, insulated design. CoverStar Cover: Key operated automation and an insulated vinyl finish – this incredible option is the only one of its kind available for free-form pools. If you’re unsure which option is right for you and your price range, simply get in touch with our team. We’re always happy to help customers figure out what will work best for them, ensuring that they enjoy a top of the range solution both now and in the years to come. No matter what type of pool cover you’re looking for, you can feel confident that the team at Remco have you covered. Just enquire with us today to learn more about our extensive range of designs or to organise for us to deliver and install yours anywhere in Melbourne!